Laughter is one the best emotions in the world and one that is unique to the human species. Who wouldn’t enjoy a good laugh, especially that deep-throated, belly laughter that leaves you aching and weeping at the same time? When we laugh out loud, our brain releases tons of the feel-good hormone, endorphin which are the body’s natural pain and stress fighter. They help to deal with painful and negative situations and induce feelings of wellbeing. Laughter and exercise go hand in hand. 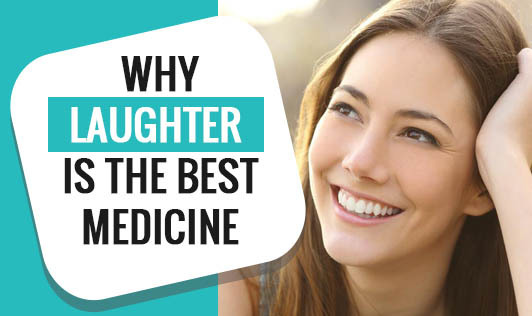 Research has determined that laughter is the best form of exercise. While it takes approximately 10 minutes on a rowing machine to build up the heart rate, it takes only 1 minute of a good belly-hurting laugh to do the same. The bonus is that it helps relieve stress at the same time . So what are you waiting for...Start laughing! Don’t know how to get started? Here are a few tips. Go back to childhood. Watch cartoons and comedies that you found incredibly funny as a child. Tom & Jerry is a sure bet. Surround yourself with happy people, ones that enjoy laughing as much as you do. Their ability to lend a comical effect to every situation will crack you up. Listen to happy songs and watch positive, happy movies. If possible sing along to a few tracks. They are a great way to lift you up. Make note of how long you spend worrying and make a resolution that you will equate every negative situation to a funny incident, seen either in movies or experienced in real life. Check out YouTube and your cable network for reruns of your favourite TV shows. Get on the band wagon; laugh your stress away.